Welcome to The ZIPPY ZEBRA’S first post! We are so excited to have you! For starters let me introduce myself. 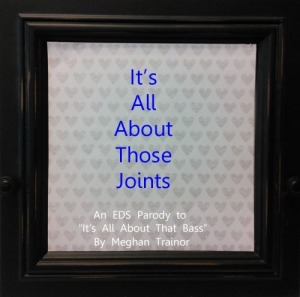 I am Tina M. and struggle with the pain associated with EDS type 3, daily. To find out more about me, EDS and why I began this blog click HERE and HERE. I have spent months trying to sort through all the information I want to share and have finally decided to make the first post very simple. 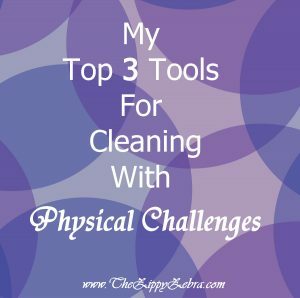 The Top 3 Tools I Use To Make Everyday Cleaning Easier (especially when I am in pain or not functioning properly). It can reach all the areas I cant! Having 5 cats and 4 people living in our home (2 with nasty allergies) means I have to dust ALL the time. I need to stay on top of the cat hair, dust, dirt and pollen everyday in order to breathe. Toss in the fact that I have OCD and I dust every surface a minimum of once a week, if not more. Update: Due to recent complications I am not longer able to dust once a week, but I still use these tools when I can. I use these to clean the return air vents, inside the floor vents, the fans, blinds, walls, picture frames, electronics, keyboards, knick-knacks and anything in between. 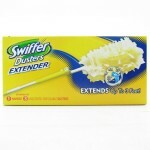 The SWIFFER EXTENDER folds in three easy clicks and can extend from short, for up close cleaning, to extra long, for higher (or lower) cleaning. I personally struggle with severe back pain and this tool allows me to dust harder to reach areas without climbing or bending. The only drawback I find with the Swiffer Extender is the fact that they use a disposable head, not only does this cost more, it is harder on the environment. I try to use them as long as I can… I begin by dusting the everyday items, like knick-knacks and shelves, and then used the already dirty one on the fans and vents or under the furniture and appliances that are close to the floor (where cat hair and dirt accumulate the fastest). 2.) A long handle cleaning wand with a strong, refillable handle and scrubber on the end. This is not the exact one I have but it is a close resemblance. I paid $6.79 for mine at Target a few months ago and it is one of the best investments I have EVER made. Here is a similar one on Amazon (price varies). I do not use it for doing dishes; I use it to clean the tub and shower. I don’t know about you, but cleaning the bathroom (tub and shower especially) has always been one of the most painful jobs in my house. Now that we have a beautiful jet garden tub it is even more painful to clean (because it is deeper and harder to reach). This tool enables me to sit on the side and reach the bottom without stretching or scrubbing. 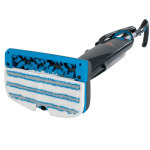 The handle is thick enough to grip and the scrubber is just rough enough to remove soap scum and buildup. If you use it every other day and give a quick once over to your tub and shower, the hard scrubbing will only need to be done sporadically. I just spray our tub with vinegar (I dislike chemicals) and run this over the soap scum and hard water build-up. Once, every 2 weeks or so, I or my hubby, will give them a good scrub down with a store bought cleaner. 3.) 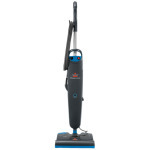 The Bissell Steam & Sweep– it steam mops and vacuums all at one time with NO harsh chemicals. I would not be able to clean all the hardwood and tile floors in my house without this valuable piece. It does require a financial investment up front, but it is so worth it. Almost immediately upon moving into our new home I suffered a life-threatening miscarriage followed by weakness and complications. It took me months just to be able to sweep the main floor, let alone, mop it. Thankfully, my mother-in-law suggested using the Bissell Steam & Sweep. We have been using it ever since. This post was in no way sponsored by the products I shared. This post does however offer some affiliate links. For more info on what that means click here. Follow us on Pinterest, Twitter, Facebook and sign up to receive emails. We will not share your email address or spam you with junk, promise! 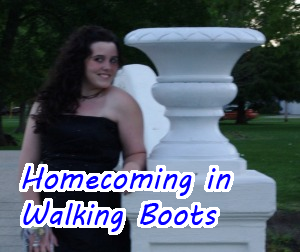 We will share each post in the email and share additional links, updates and fun stuff on facebook. Do you have a favorite house cleaning tool, something you would like to share with others? If so, please be encouraged to share it in the comments section. We are here to help and support others by finding ways to live their lives with a little less pain and more pleasure. Next week we will begin featuring a post on what to do when the struggle gets the better of you and you are stuck off your feet and feeling despair. If you have any suggestions please submit them to thezippyzebra@outlook.com. 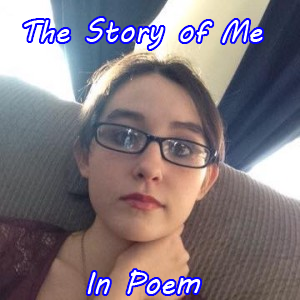 Check out some other great posts at Memories By the Mile.